Washington state is situated in the Pacific Northwest and is compromised of geographical areas like the Cascade Mountains and Puget Sound forests. The state is known for its frequent rainy days with fog and drizzle. Summer days tend to be mild and human, rarely going beyond 80 F, while wintertime often requires warm clothes, despite it rarely dropping below 45 F. Visitors recognize its largest tech-thriving city, Seattle, as well as its popular destinations like the Space Needle, Pike Place Market, and Seattle Aquarium. Washington state was founded in 1889 and is named after the first President of the United States, George Washington. The state was formed out of the western part of the Washington Territory which was surrendered by Britain in 1846 following the Oregon Treaty. This Evergreen State is known for its six national forests and 215 state parks, including Mt. Rainier, Mt. St. Helens, and Olympic State Park. Washington state offers Amtrak train transportation through the Passenger Rail which connects from Vancouver, B.C. to Eugene, Oregon. 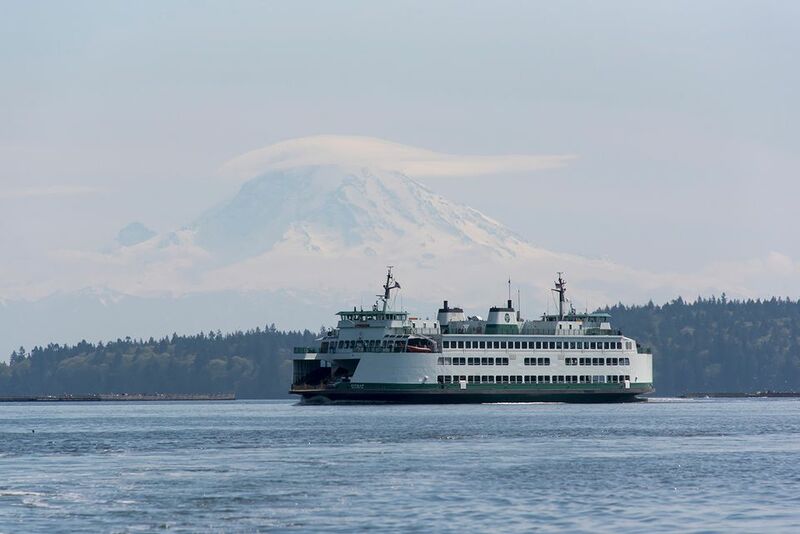 Every day, four round trips are made between Seattle and Portland. Commuters can organize rideshares through RideShareOnline.com to find carpools and vanpools or prearrange a group of five to 15 individuals to the same destination. Most popular is Washington's Intercity Bus Program providing travel statewide through the apple, Dungeness, gold, and grape lines. There are also additional bus options through the Greyhound, Bolt Bus, and Northwestern Trailways. There are so many fun things to see and do in Washington, you'll have no trouble filling your travel itinerary. Visitors can enjoy popular state attractions like Olympic National Park, Mount Baker Highway, and Mount Rainier National Park. Olympic National Park is a wilderness preserve known for its variety of ecosystems including mountains, rainforests, and ocean beaches. With over a million acres, travelers can backpack the grounds, spend a night camping and lodging, or find places to fish. Mount Baker Highway is a great option for travelers wanting a quick day-trip. This rural area is full of beautiful recreational areas that stretch along 60 miles. Maps are provided by the US Forest Service ranger, who can also let you know about where to get out of the car for hiking or picnic options. You can expect to spend at least an hour on this drive across Washington Highway 542. Mount Rainier National Park provides a fascinating outdoor view that one must see in person. This mountain landscape has various scenic viewpoints, driving tour options, and a horizon great for photography. This state reserve also offers a high point for visitors to stop at to see volcanoes nearby such as Mount Adams. There is a great selection of hotels and lodgings available throughout the state of Washington. Find your perfect place to stay during your travels in Washington starting with these few suggestions. Alta Crystal Resort: Alta Crystal hotel in Crystal Mountain is close to Mount Rainier and offers amenities like a honeymoon cabin, hot tub, and kitchenette. Pets are allowed at this lodging facility which also has free Wi-Fi and parking as well as a multilingual staff for diverse travelers. Visitors will also enjoy comfortable beds, relaxing fireplaces, and suites with a balcony. Lake Quinault Lodge: Lake Quinault Lodge is a great option for those staying at Olympic National Park & Forest. With fireplace rooms, free internet and parking, a pool and a restaurant, this is a great option for families looking for some quality time in the outdoors. Rooms fill up quickly, so it's important to book in advance. Those who want a view will experience more noise and an increased rate, while those without one will find something quieter and more affordable. Mayflower Park Hotel: Those looking to stay in the heart of downtown Seattle should strongly consider the Mayflower Park Hotel. This quaint and friendly accommodation has nice rooms, a historic feel, and a great location near stores like Macy's and restaurants like Andaluca. Individuals staying here will also enjoy Oliver's bar, Westlake Center, and the monorail station nearby. Pike Place Chowder: Seattle visitors can enjoy some classic clam chowder at Pike Place Chowder, a top restaurant for American fare, seafood, and soups. Situated at 1530 Post Alley at Flagship Chowder House, this dining option offers delicious seafood bisque, crab rolls, and oyster crackers that are worth the wait in line. The Red Hot: This cheap eat located in Tacoma, Washington is great for those looking for an American hot dog paired with a cold beer. Located at 2914 6th Ave, this menu has options for both vegetarians and meat eaters alike with a selection of sides like mac and cheese and mashed potatoes. Old School Pizzeria: Fans of Italian food in Olympia can enjoy this vegetarian-friendly pizzeria full of New York to Chicago style pizza, garlic knots, and thin crust options. Kids can have fun with the arcade games before and after dinner, while adults can explore the atmosphere of being near downtown at 108 Franklin St NE. Travelers should be aware that there are significant restrictions for those possessing and using pot, despite there being several shops that sell marijuana. Smoking is allowed on private properties that are not seen by the general public and those over the age of 21 have more flexibility with its products and paraphernalia. Travel services are available through Kush Tourism for guided cannabis tours throughout the year as well as at the Seattle Hempfest festival every August.